What do you call a show within a show? 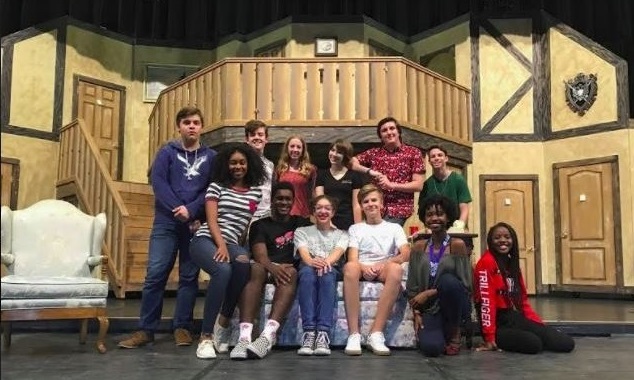 If you said “paradox” then you’re wrong, it’s called “Noises Off,” a spectacular show about what really goes into a production. The show “Noises Off,” performed by Apopka High School, was published in 1982 by English playwright Michael Frayn. Both the original in 1983 and revival in 2016 were nominated for multiple Tony Awards and Drama Desk Awards, the former winning two of their categories. “Noises Off” is the telling of what goes on during a performance on stage and off stage, and exactly how many things can go wrong. Between love quarrels, pure confusion, and snarky comments there isn’t a dull moment in the show. Each character managed to captivate the audience in their own specific way, each having distinct qualities that were enjoyable to see. All the actors on stage held a strong presence with their character and made sure not to take away from their scene partner, an amazing attribute when it comes to performing. Let it be noted that each performer deserves a full around of applause for their fine work in this production. Dotty (Alyssa James) carried a sense of level-headed ness regardless of the chaos around her, a hint given through James’ character choice of passive aggressiveness. Garry (Matthew Zenon) would send the audience into a fit of laughs with his lines, all well delivered and expressed through Zenon’s physicality. Both Belinda (Tatum Ivy) and Frederick (Jameson Stobbe) worked as a unit, Ivy and Stobbe establishing a truly, home-y feel to their characters. Poppy (Marissa Dean), Lloyd (Cooper Smalley), Brooke (Shiela Smith), Tim (Nicholas Lane), and Selsdon (Daniel Mitchell) all brought the plot together and put a uniqueness into their characters that would go noticed. As seen in Act II, an orderly backstage is just as important as an orderly show. The note about giving a round of applause for robust work applies just as well to tech. Having that in mind, costumes were on point with their time period appropriateness, especially Brooke Ashton’s dress and Mrs. Clackett’s maid attire. Set was designed in a way that allowed for a smooth set transition and paired along with sound very well to add entertaining music that helped distract the audience from what would usually be done in silence and take a while. It was a new, refreshing take on a tech element such as the set change. 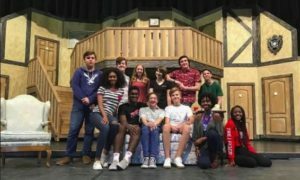 Apopka High’s production of “Noises Off” kept the audience going with it’s high energy, fast paced content. It should also be mentioned that the actor’s maintained high energy throughout the performance. After this exciting debut you can’t help to think of how “rediculas” the reality could be of any show you see.